In fact, learning was so low down on the list (back when our lives were dominated by hospital admissions and appointments) that I resorted solely to books on tape with the hope that a portion of the monologue might, just might, get through to her asleep there on the couch. Seven years later, however, Mathilda attends 6th grade in a small Catholic school in the Greater L.A. Area. She is able to attend every day because of her very specific medical regime, punctual and consistent sleep hygiene (naps), kind-hearted peers, and super-supportive teachers. One in particular, Miss Anderson, is experienced at teaching pre-teens in an academically rigorous environment. So dedicated is she to the task of enabling all her students to thrive that she embraced the challenges of teaching a child like Mathilda, despite the fact that narcolepsy has the potential to adversely affect classroom dynamics. By her own admission Miss Anderson has never taught a child with narcolepsy before. But when I met with her this summer before term started, she wasn't phased by the prospect, even though I had serious concerns about Mathilda falling asleep in class, being too tired to do homework or any extra-curricular activities, and unable to keep up on field trips, P.E., and increasingly complex social situations. We all know that sixth grade can be an intellectual and hormonal minefield even without a chronic condition to navigate as well. With every new academic year I seriously wonder if this it--whether this will be when the pack breaks away and my child with narcolepsy will be left in the messy wake with her lack of social filters, not to mention the consequences of sleeping through Latin class, Math, and Mass. Given how many hours a day children spend in school, coupled with the prevalence of narcolepsy (1:2000) it is important for educators to be aware of the critical difference between exhaustion (within normal parameters) and a serious sleep disorder. Screening tools for enabling teachers to identify undiagnosed children with narcolepsy are being developed in the same way that assessment strategies are available for kids who may fall within the autism spectrum. In a few years from now, these assessment tools will be in every staffroom, available to every teacher and on the radar of every headmaster. 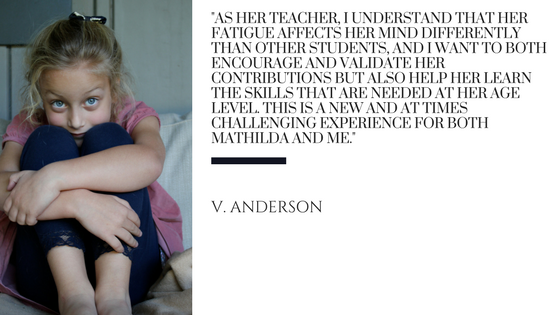 Miss Anderson is hopeful that her experience in educating a child like Mathilda will resonate with other teachers who similarly juggle the needs of the whole class with one who battles staving off the ungovernable symptoms of narcolpesy. "My name is Vanessa Anderson; I am a teacher at St. Monica Academy, and this year Mathilda Crisp is one of my sixth-grade students. I have taught sixth grade for eight years, but teaching Mathilda, a child with narcolepsy, is an experience much different than teaching other children, even children with diverse learning abilities. 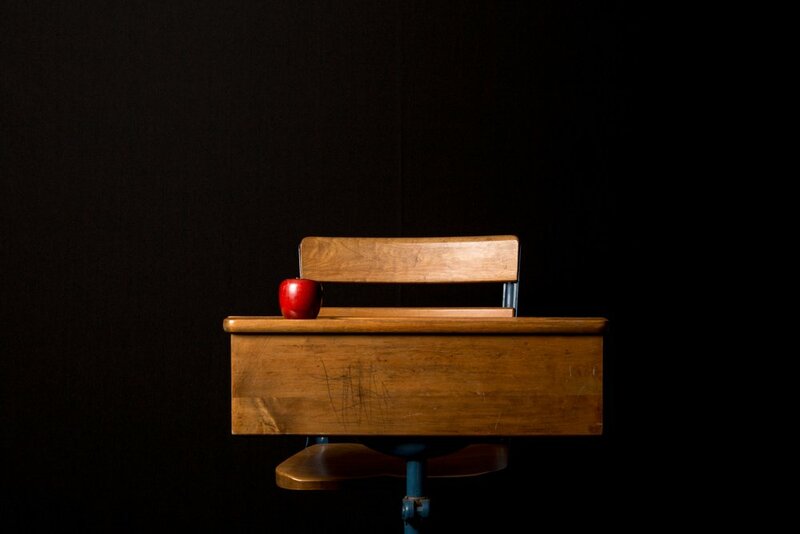 Students in a classroom environment acquire and practice many different skills, both academic and social. Mathilda, due to her high levels of fatigue, struggles to control her words and emotions. This affects her in a variety of ways. When she is very tired, she can be disoriented or need to take a nap on her desk. She might become argumentative; during class discussions she can give her opinion forcefully, sometimes over other students, and when she is working or playing with her peers, she can insist on doing something a particular way, which sometimes causes misunderstandings. She can be overly upset; this can happen when she is corrected and feels she has done something wrong. If she cannot complete something the way she sees it should be done, she can become overwhelmed. She struggles to be concise and summarize, and will sometimes continue to explain far beyond what is asked or tell a story that contains excessive detail. As her teacher, I understand that her fatigue affects her mind differently than other students, and I want to both encourage and validate her contributions but also help her learn the skills that are needed at her age level. This is a new and at times challenging experience for both Mathilda and me. Despite these struggles with her fatigue, Mathilda does exceptionally well in her academics. She is bold and not afraid to try new things or speak her thoughts. 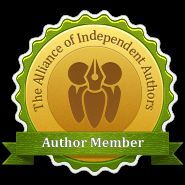 Her imagination is rich and vivid, and she takes a vivacious delight in reading and writing. Her analyses of events in history and literature are nuanced and insightful, and I think her gifts are due in part to the nature of her experiences with narcolepsy. From what I have learned teaching Mathilda, I think her perspective is a unique and powerful one. I look forward to seeing what she can do and become, despite and perhaps because of, her narcolepsy." With grateful thanks to the staff and faculty at St. Monica Academy, especially Miss Anderson.